The Motorola Moto E has been around and before we are done with its in-depth review we’ve decided to share its battery life test results. The Moto E is running on the very efficient Snapdragon 200 chipset relying on two Cortex-A7 processor cores and a big enough 1,980 mAh battery. The latest Android KitKat and its optimizations should help too. 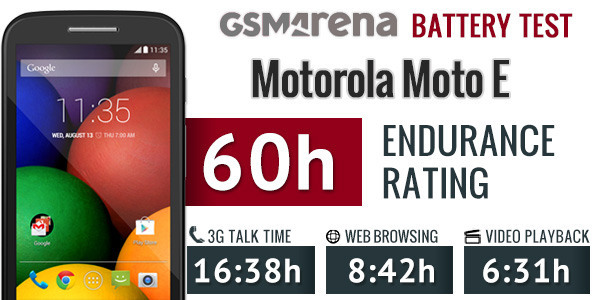 The Motorola Moto E did excellent in our dedicated 3G talk time test. Its battery went flat after 16 hours and 38 minutes, even better than the Moto G.
Next, we put the Moto E throughout our web browser test. . The battery ran out of juice after 8 hours and 42 minutes, a great achievement for such device and very close to its Moto G sibling. Our final individual test gauges the video playback endurance. Moto E turned out quite poor video player – the battery dropped down to 10% after six and a half hours. We’ve seen worse, but that’s still a rather poor score. 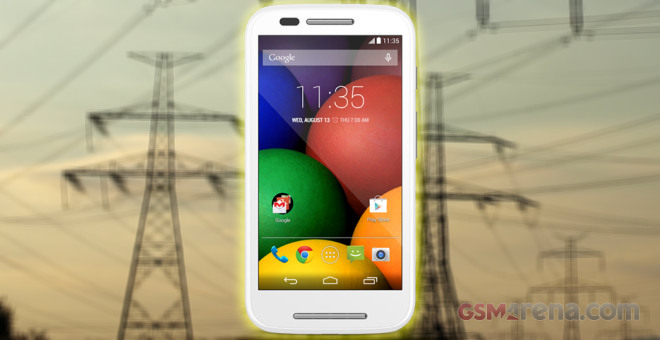 The Motorola Moto E had below average power draw on stand-by, which is quite the achievement for a budget phone. This helped it to a final endurance rating of 60 hours, which means the Moto E will last exactly two and a half days if you do an hour of calls, an hour of video watching and an hour of web browsing each day. For more information on our battery testing or scores from other devices you can check out our Battery Test page.